Oh, this is gorgeous!! ❤ Is it also your painting? I just love the painting! I wish I could have it on my wall!! I love it very much! ❤ It is beautiful! I don't know anything about technology so I wont try, I will just enjoy it here on your blog. But is it okay if I download it and keep it on my computer to look at? Wow! Lovely poem and what a beautiful word nastukashii is !! Thank you, Rajani. There are so many amazing words with no English translation. That’s so true… or the translation is so elaborate and clunky that you can never use it in a poem! Lovely poem Ryan and I too love the painting. Love your whole website by the way. Great style. Sugoi! Kanashikute natsukashi!!!! I love this one. 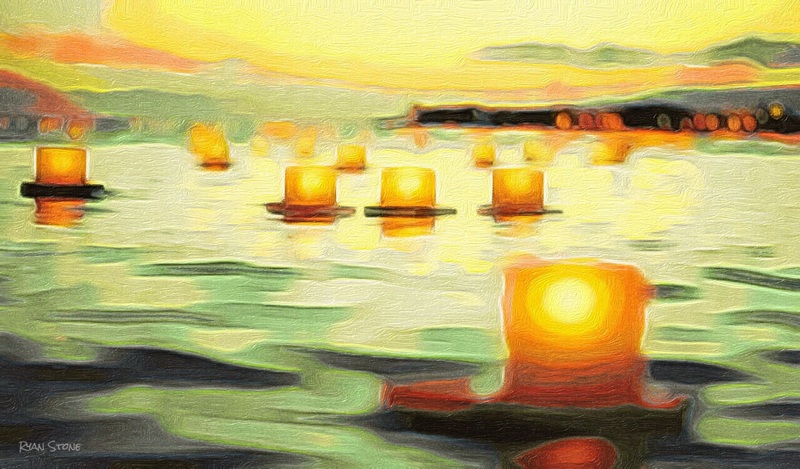 Guiding the spirits to the other world, while lanterns flow in the river wishing the departed a safe voyage. A beautiful poem that has mixed the culture with the feelings of loss. Your words are lovely thank you, D. What would you have me read? Now when and why did I miss this last year? Superlative! And yes, that word!!! Yes, only sapped from the heat & humidity – it’s high summer where I’m at, Ryan! Come by, sometimes? Beautiful poem, Ryan. I agree with you about languages. I once wrote a poem and couldn’t find an English word to describe the intensity of the color and had to use a Greek word. Your digital painting is gorgeous. Wow Ryan congrats on the nomination. So well deserved!! !